Just a quick note to say that I’m aware of 23andMe’s new site, unfortunately I don’t have access to it and have no idea if/when my account will be transitioned. The extension will continue to work on the original site, but I am unable to modify the extension to work on the new site or ensure it isn’t causing any issues. 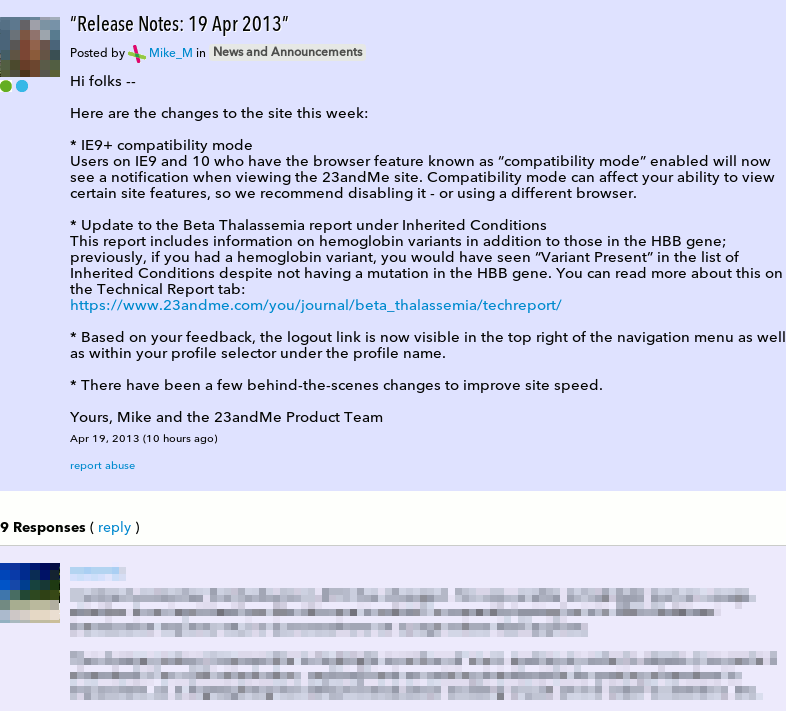 If you’re on the new site I would recommend disabling the extension. If anyone wishes to contribute code to work on the new site I will gladly accept it. Let me start by thanking the various people who have reported issues with the extension over the last year or so, please accept my apologies for not getting around to fixing them until now. As always you’ll get the update automatically if you have the extension installed. In other news, looking back at my last post from February 2014 I said that the extension had 1,720 users. Today it has a massive 4,142 according to Google! That’s a 2.5x increase in just over a year! But only 53 reviews in the Chrome web store??? Please rate 23++ if you like it (or even if you don’t). 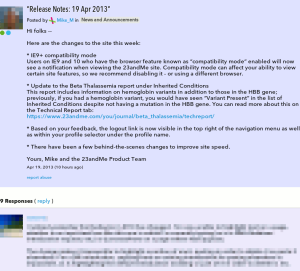 It’s been a while since I’ve posted anything here, but I am still updating the extension every so often when I spot a bug or when 23andMe change something. I’ve made some minor changes today to fix some bugs, so the current version is 2.1.6.1 (I missed something in 2.1.6 so… 2.1.6.1). The previous issues with the Chrome webstore appear to be resolved for good, so the extension should be available from there via the download page for the foreseeable future. As of today the extension has 1,720 users according to Google, which is more than double the number it had a year ago. If you haven’t already, please rate the extension in the Chrome web store. Update: the extension is back on the web store for now, so you can install from the download page. Once again Google have removed 23++ from the Chrome Web Store without offering any explanation. To install the extension you’ll need to download and install it manually. To do this, follow the instructions in the post I made last time they did this but use this download link to get the latest version. The current version of Chrome appears to have made this process even more difficult – if, when you do Save link As, Chrome tries to save the file as 23pp-2.1.4.bin, you’ll need to change the extension from .bin to .crx for the rest of the process to work. I’ve added a bunch of new features recently which are easy to miss if you don’t know they’re there, so I thought I’d better point a few of them out. Firstly, Enhanced Messaging is now enabled by default. I appreciate that some people can’t use it because they have a slow Internet connection or a lot of messages, so it can be disabled in the extension settings (more on that later). You can hover over it to see which version of 23++ you have, and also link through to this site to see what the latest updates are. In the community the extension highlights each post in a thread with alternating colours to make them easier to read. You can pick your own colours in the extension settings. The line spacing has also been changed to make it more sensible and the font is a little bigger. You can pick whatever colour you like for the background in the settings. These settings can be accessed from the home page widget and also through Chrome by going into Menu -> Tools -> Extensions and clicking on Options in the 23++ entry. Those are all the major changes, but there have of course been various other minor or cosmetic changes to improve the overall experience. I have updated the about page to detail all of the features currently in the extension (it had got a bit out of date!). The current extension version is 2.1.4, which you’ll get automatically if you have the extension installed, if you don’t then you can get it here. And finally, a few stats. In the 2 years and 4 months since I made the first release of the extension it has acquired 878 active users (as of today, according to Google) and now consists of a massive 1,708 lines of code (which doesn’t include the numerous 3rd party libraries the extension uses, or comments). If you like the extension please consider rating or reviewing it at the Chrome web store.